From left are Clinton County Public Defender Rob Baker, and two members of the Clinton County Public Defender Commission Dan Hendershott and Chaley Peelle-Griffith. 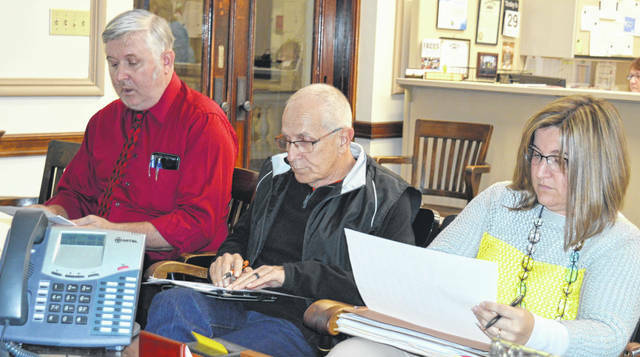 They discussed the Clinton County Public Defender Office’s calendar year 2019 budget this week with county commissioners. WILMINGTON — Clinton County’s public defender has asked county commissioners for a $16,000 increase in his office’s salary line item, saying it’s needed to bring the office into compliance with the Ohio Administrative Code. The public defender office was one of five county government departments to hold individual budget meetings with Clinton County commissioners on the first day of the annual budget appointments. The others were Building Regulations, Treasurer, Board of Elections, and the Records Commission and Microfilm budgets. Clinton County Public Defender Rob Baker advised that the county would receive a 42 percent reimbursement if his request to increase the salary line by $16,000 is carried out. Steed, who leads the local budget talks with county department heads, said when the county commissioners here do the budgets, they ask every office to start discussions at a zero salary increase. Then, commissioners and the department heads will go through the proposed line items in the individual departmental budgets and, in Steed’s words, first pay the bills as they go through the budget process with all the county offices. Then, if there’s the will and the ability, commissioners will provide additional funds throughout the county offices staffs “on the most even basis we possibly can,” said Steed. A public defender or an assistant public defender provides legal representation to people accused of a crime who cannot afford to hire an attorney. It is Baker’s view that the position of public defenders should be seen more as a career rather than as a stepping stone to something else in the field of law. “I want to be able to pay the appropriate amount of money they should be making,” said Baker, who’s been a part of the Clinton County Public Defender Office for a dozen years.